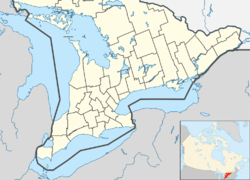 Guelph/Eramosa is a township located in Wellington County, in midwestern Ontario, Canada. It partly encircles the city of Guelph, surrounding it in a continuous arc from approximately northeast to south-southwest of the city. It is part of the Guelph census metropolitan area. The township was created in 1999 by the merger of the townships of Guelph and Eramosa, as well as parts of Pilkington and Nichol Townships. The name Eramosa was derived from the native word Un-ne-mo-sah (possibly meaning "black dog", "dead dog", or simply "dog"). Eramosa Township was settled primarily by Scots and Irish; in 1841, its population was 935. The mayor of Guelph/Eramosa in 2018 is Christopher White (since 2010). Township councillors are Bruce Dickieson, Corey Woods, Louise Marshall and Mark Bouwmeester. County councillors are Don McKay and Doug Breen. Now a major auto parts manufacturer with 22 plants in Guelph, Linamar was started in the village of Ariss in 1964 by Hungarian refugee Frank Hasenfratz, initially in his basement. The company, with a staff of five, was incorporated in 1966 as Linamar Machine Limited. Linamar's first major contract was to manufacture automotive oil pumps for Ford. Rockwood is the main community in the township. Rockwood is located on Highway 7 between Acton and the city of Guelph. The Eramosa River runs through the centre of the village and is the reason for Rockwood's existence – having been the source of power for several mills that were the economic engine that spawned the original settlement. Limestone was also extracted from what is now the nearby Rockwood Conservation Area at that time. The conservation area is used for swimming, hiking, canoeing, picnicking and camping from last Friday in April to the Sunday following Thanksgiving and it has over 65,000 visitors a year. The conservation area features a small reservoir on the Eramosa River, karst formations, and caves. In addition to Rockwood, the township also includes the smaller communities of Ariss, Armstrong Mills, Birge Mills, Brucedale, Centre Inn, Eden Mills, Eramosa, Everton, Marden, Mosborough, Redwood Hills, and Rockcut. The area was settled by the Attawandaron Nation, also known as the Neutrals in the 1600s and the territory was held by the Mississauga of the Credit; the latter sold a large tract of land to the government in 1818 and it was first surveyed that year; the name Eramosa was then used to describe the large parcel of land. One small area was named Eden Mills in 1846 by Adam Argo who had built a mill there. Over the years, the hamlet had a grist mill, an oatmeal mill and several saw mills powered by the Eramosa River. Other businesses also thrived and there was a stop for the Toronto Suburban railway (later becoming the Edgewood Camp) which ran from Toronto to Guelph. As recently as 1950, two churches and a school (SS#11) operated in the hamlet. The population of the hamlet in early 2019 was 350. Great Northern Railway founder James J. Hill was born in Rockwood in 1838. ^ "Township of Guelph/Eramosa Final Summary of Election Results" (PDF). Township of Guelph/Eramosa. Retrieved 2018-11-28. ^ a b c "Guelph/Eramosa community profile". 2011 Census data. Statistics Canada. Retrieved 2012-02-11. ^ Quaile, Deborah (2007). Eramosa Anecdotes. Rockwood: Wordbird Press. ISBN 978-0-9733911-3-8. ^ Smith, Wm. H. (1846). SMITH'S CANADIAN GAZETTEER - STATISTICAL AND GENERAL INFORMATION RESPECTING ALL PARTS OF THE UPPER PROVINCE, OR CANADA WEST:. Toronto: H. & W. ROWSELL. p. 55. ^ "Township of Guelph/Eramosa Final Summary of Election Results" (PDF). get.on.ca/. Oct 22, 2018. Retrieved November 28, 2018. ^ "Eden Mills set to celebrate its history". Guelph Today. 27 January 2019. Retrieved 22 February 2019. Wikimedia Commons has media related to Guelph/Eramosa. This page was last edited on 22 February 2019, at 17:13 (UTC).